Outlining the purpose of your awning is the first step in choosing the right color. Now that you’ve decided that you want to invest in an awning or group of awnings for your property, the next choice is the right color. There are a few considerations to keep in mind when making your choice. It can be a stressful process, but it can also be fun. Outlining the purpose of your awning is the first step in choosing the right color. Is it for your home or the exterior of your business? If it’s for your home, maybe you can be a little riskier with your choice. If it’s for your business, maybe there is a logo or style that you’d like it to match. You also want to think about the color being inviting to customers and clients. For your business, the color of your awning will be an extension of your branding, which is important to include in your decision-making process. It may seem like a far-fetched question, but what story are you trying to tell with the color of your awning? Are you trying to add excitement to the exterior of your property? Do you desire a more calming effect? Your personality and the vibe of your home or business will also give you direction in making this decision. If you want your guests and visitors to feel relaxed, confident, or excited about entering your building, color is the perfect way to help convey those emotions. The consideration of cohesion is especially important for homeowners. You want the color of your awning to complement the color of the brick or siding of your home’s exterior. Think about a color palette that blends well with the colors that already exist on your property and that will help lead you toward the right color. Check out the neighborhood surrounding your property. 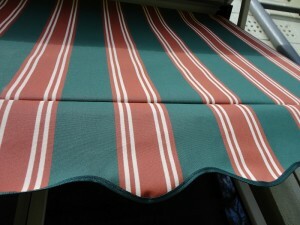 Would you like your awning to match or complement the colors around you or would you like to stand out from the crowd? For a business, this question probably isn’t as important because the colors being represented should match the brand. For homeowners, however, the neighbor in which you live could be a great influence on your color selection and help lead you toward choosing the right color.